AP model school admissions 2020 6th class notification : AP Model school notification is released, ap model school admissions schedule available on official portal for 6th class entrance exam to be conducted on 31st March, 2020. ap model school online application forms will be started from 10th Jan 2020. Hence candidates can check ap model school 6th class admission notification 2019-2020 and other relevant details from the following article. DSE AP is inviting apms application from the interested candidates who are aspiring or seeking for admission into 6th class and few vacancies in other classes. The authority is going to conduct the ap model school admission test on 31st March, 2020 for the session 2019-20. Students can download the AP Model school Notification 2020 for admission into model schools from the official web portal apms.cgg.gov.in. AP model school application link is activated from 10th January 2020, which is given below if you want to apply through online mode. 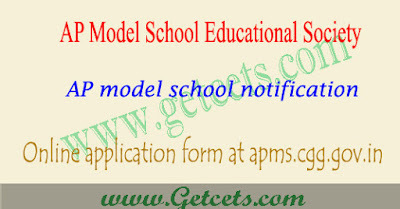 Candidates can check relevant latest news (updates) of AP model school admission notification, apms application, apms school website, apms school admissions, ap model school application online 2020, apms 6th class exam date, ap model school hall tickets and ap model school results 2020 through this website. Refer the official ap model school notification 2020 and check the APMS Eligibility Criteria is mentioned in the official apms notification , check and submit the apms application form on or before 11th February 2020. Candidates can obtain apms application 2020 on payment of Rs.100/- for OC and BC candidates and pay for Rs 30/- for SC/ST candidates from apms.cgg.gov.in. Age limit : Students belonging to OC/BC category are born between 1st Sept 2008 and 31st Aug 2010. If candidates belongs to SC/ST category are born between 1st Sept 2006 and 31st Aug 2010. Candidates must be read by 2018-2019 and 2019-20 Academic years in Government and Government Recognized School in Concerned District. Students those who were passed V class are eligible for applying for VI class admissions into ap model schools for 20120-21 academic year. The AP model school 6th class admission test Question Paper Booklet contains 4 sections, the Question Paper booklet will be based on V Class syllabus and objective type with multiple choice answers as shown below, duration of examination is 2 hours . The parents to be ensured that “once the admission is taken in VI class, the entire education of their children up to II year Intermediate” will be looked after by the Government. Highly qualified teachers, extra study hours and particularly stressing that the medium of instruction is in English. Meetings with self help groups, parents etc., may be organized to publicize the objectives of Model Schools and the importance. Pamphlets to be printed and distributed in surrounding villages of Model Schools narrating the advantages of studying in Model Schools. Coaching classes to students may be conducted freely for a week or so on effectively answering the admission test to boost up their confidence. Flexies may be displayed in important places i.e., in 0/o Mandal Revenue Officer, Mandal Resource Centres in village secretariats and prominent places in Mandal. The AP Model school entrance exam has conducted on 8th April 2020 for the candidates who had filled and submitted the APMS application forms. Candidates who are going to attend for the written test are waiting for the results, publication of APMS 6th class entrance exam merit list on 11th April 2020 and final selection list will be released on 15th April 2020 on official portal, click on the AP model school Results link given below to check your result after official announcement. Frankly ask us by comments and share this AP model school notification 2020 6th class admissions article with friends on social media for appreciation for us and we may again continue for the AP Model school admission notification 2021 , AP model school admissions 2021 and apms application form 2021.